We would like to take the chance to tell you thank you for everything you have done for us and it’s clear that this progress we just made will not be possible without you. This journey has not been easy and especially when we don’t know the answers to many questions in our mind. Meanwhile the different techniques suggested to attack this special need continue to fight for the financial resources from the parents and few do what is right. Your experience has contributed to our son’s development. During the long hours conversations we had with you over the phone or at home, we realised that your expertise in autism was beyond any limit and it was at our reach and we did imagine why some one like you will do what is right. Help, hope and handling is what better describe you. Because you did open limitlessly all your experience and knowledge for a greater good. Thank you for everything, ARN! I want to express my deepest gratitude to ARN. Thank you for the kindness, thank you for all the efforts, thank you for the time, thank you for everything that you have done for my son. I can only imagine how much time and effort you have put in to make this possible for Andrew. You are not obliged to go to this extent to help Andrew, but because of your generosity and kindness, Andrew managed to have access to all these valuable resources. The help you have extended is totally beyond what I would have expected. I am emotionally overwhelmed by the genuine care, concern and kindness that you have extended to Andrew and me. 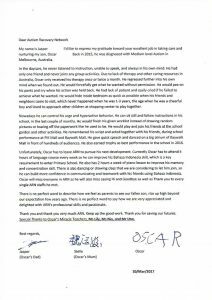 Please also help me send my deepest gratitude to Dr Partington for his detailed assessment of Andrew today. No words could describe my deepest gratitude to Dr Partington who have spared time amidst his busy schedule to take a look at Andrew. His kindness and generosity are held closely to my heart and besides "thank you", I really couldn't think of a better word to express my immense gratitude that I am feeling from the bottom of my heart. Please kindly pass this message to Dr Partington on my behalf. Once again, a big "thank you" to both of you from the bottom of my heart. Both of you have touched lives of many people, and I am very grateful that Andrew is one of the blessed kids. To my friend Dino and the great ARN team! Thank you! ABA works! Thanks to all your intervention, my boy went from almost completely nonvocal to speaking more and more every passing day. His daily improvement is now just amazing to watch! Thanks for giving us back hope and recovery from something we never thought possible. Amazing work by ARN! Due to the amazing work of Dino Trakakis’s therapists Alvin actually recovered and lost his Autism diagnosis. This is a total validation of ARN’s ABA/VB therapy. Today April 12, 2016, after a grueling selection process, he was accepted into the Phillips Exeter Academy in Exeter, New Hampshire, the number one high school in the United States. It certainly did not look possible when Alvin first sought Dino for help in early 2005. No-one can doubt what ARN can accomplish. To me it is essential to help a child because these are critical interventions. To be honest, it never occurred to me that my son is able to do mainstream curriculum. When he was much younger, i would never have dreamed that he can cope and is able to understand. But today when i look back, through all these interventions, we do see the result today, that he’s still able to understand and cope.